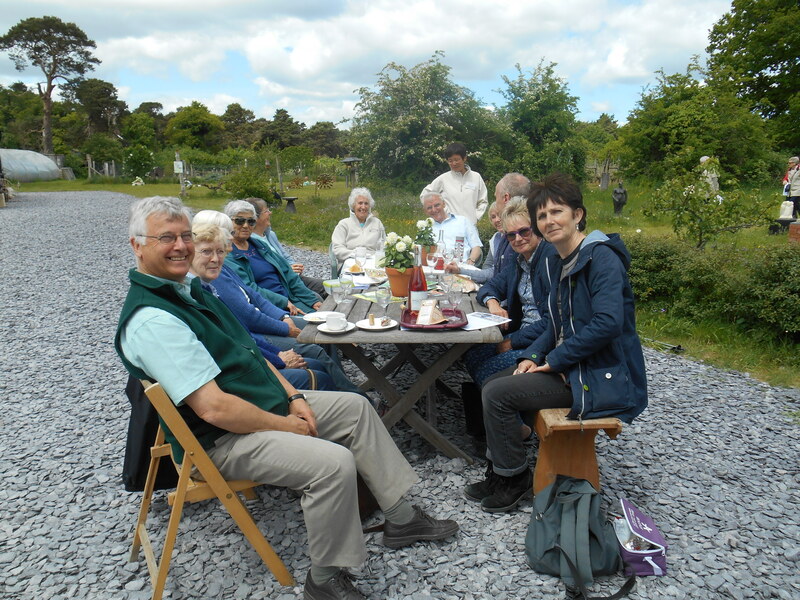 After our trip to Chedworth Villa last year, many volunteers were keen to visit again this year when the Chedworth summer excavations were taking place. Chedworth run a 2 week excavation every August in a programme exploring the north wing of the villa. 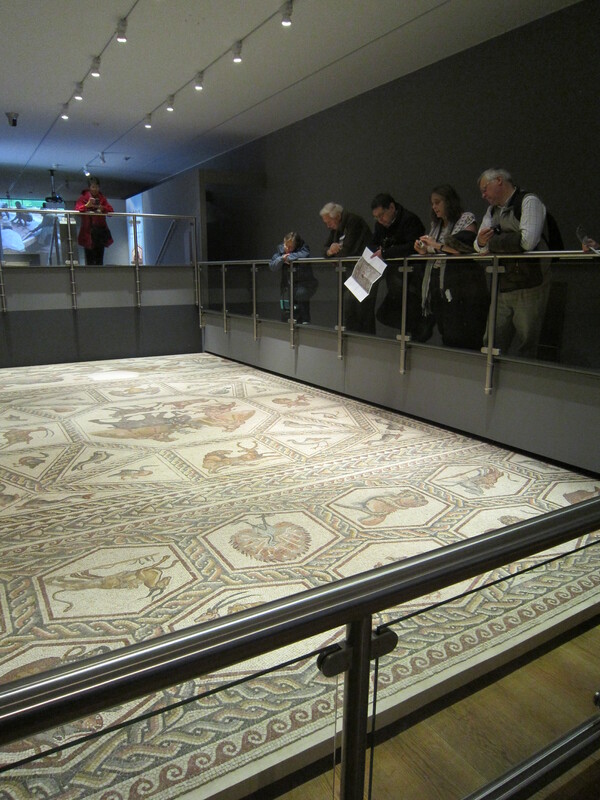 In 2014 they found a large unknown mosaic floor measuring 18m x 6m long. The archaeologists think this must represent a grand reception hall. 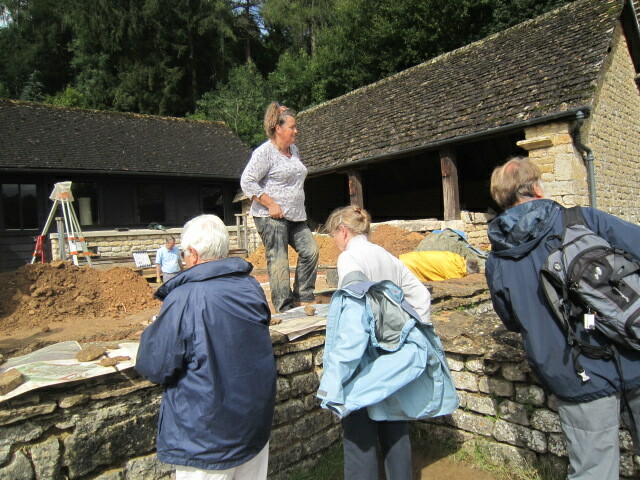 Our visit to Chedworth this August was in the final week of this year’s excavation programme. The archaeologists were digging the changing room area of the north wing bath house and an adjacent apsidal room. 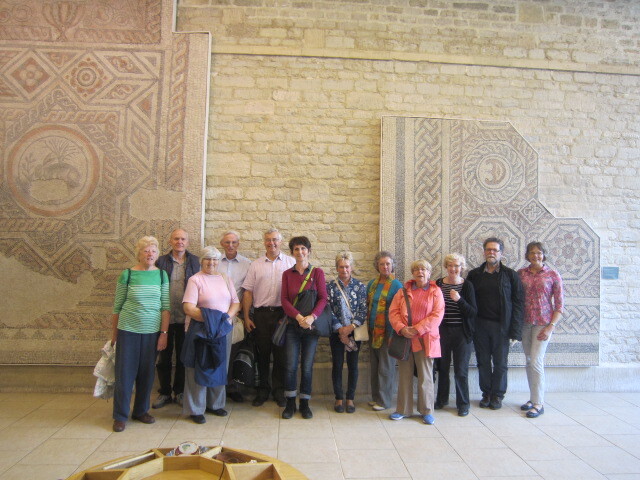 Here they found more beautiful sections of coloured mosaic floor, plain tesserae, and some very fine painted plaster. We were shown some of the best pieces of plaster, one of which had a complicated geometric design on, very different from the plain colour washes and occasional red stripe on the plaster fragments we found near the temple buildings at our site in Marcham. 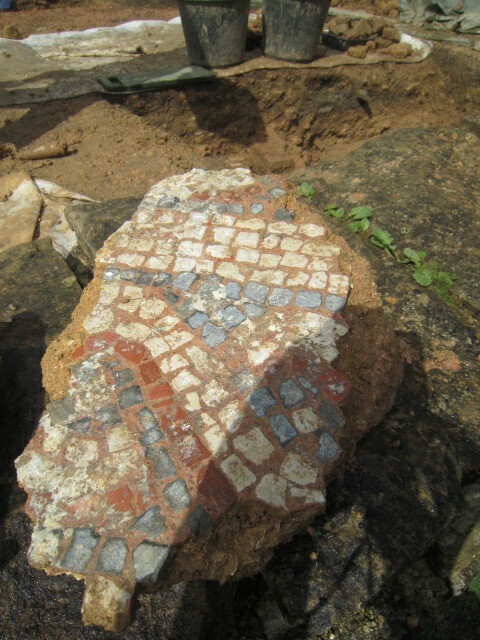 The mosaic segments we were shown had a curvilinear design executed in bright reds, blues and white. 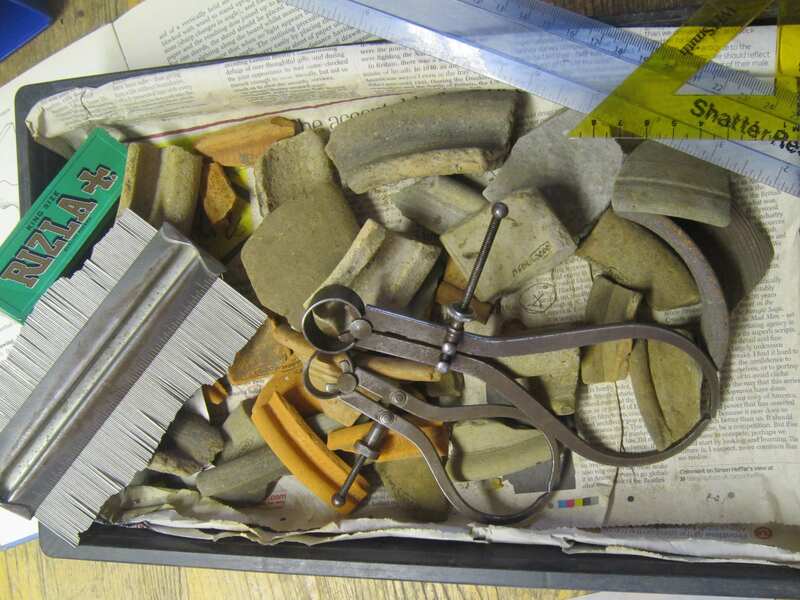 Again this was in great contrast to the evidence we had for tessellated floors at the Marcham site, all of which has been recorded in detail by the Trendles volunteers. The bulk of our tesserae were plain cut-down red tile or brick, representing plain tessellated floors, rather than decorative mosaic floors. After looking at the excavations our group had a good look around the Roman workrooms where one expert was demonstrating Roman medical techniques and tools, and another was talking about techniques of constructing mosaic floors. 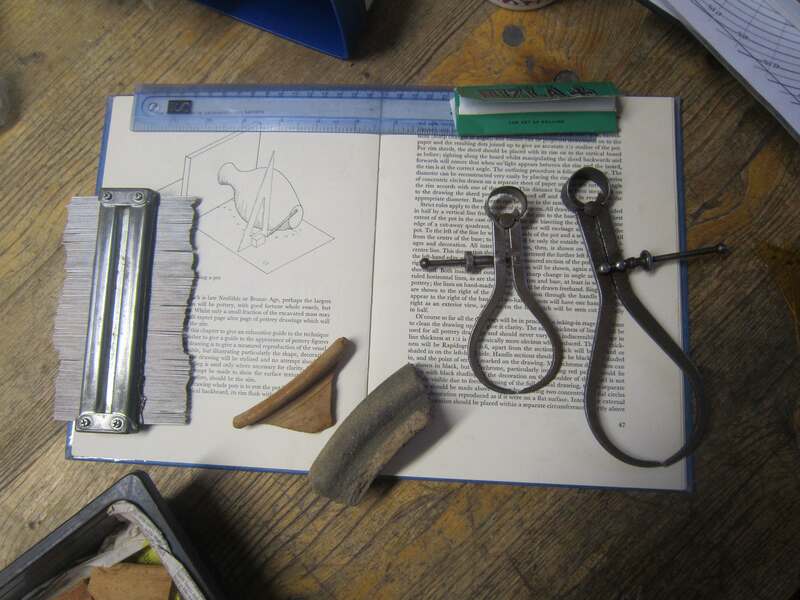 The expert in Roman medicine showed us the extensive Roman tool kit the more skilled doctors would have used, including small circular tubes with serrated edges for cutting a hole in the skull and various lancing and probing tools –some of which brought a tear to the eye just thinking about their use! Various members of our team, including Jon and Sue who are both doctors, asked some probing questions (no pun intended!) about these ancient medical techniques. I think we all learned something new about the Romans on this visit to Chedworth Villa – the educational programme Chedworth offers is always extremely good. After lunch at Chedworth we moved on to Corinium Museum at Cirencester for a look around the museum and a talk about the treasures of Corinium by Collections Officer James Harris. We were shown some wonderful finds from the Museum’s store rooms, which house an Aladdin’s Cave of archaeological objects from the rich Prehistoric, Roman, Saxon, and Medieval past of the area. As Cirencester was at one point the second Roman city of Roman Britain, the Roman material from the city excavations is particularly impressive. 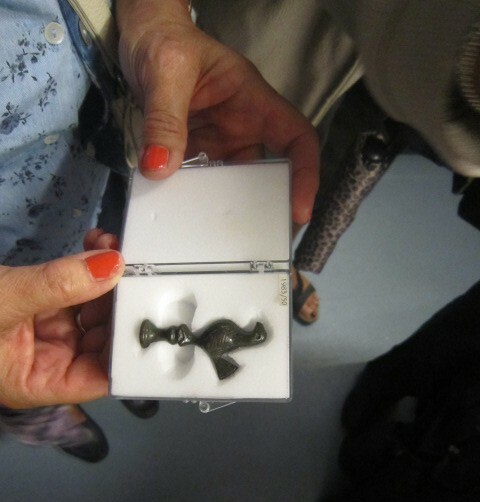 We were shown tray loads of Roman copper alloy brooches, and beautiful metal animal figurines, many from the museum’s 19th century founding collection from the Earl of Bathurst and Wilfred Cripps. We were also shown some fine examples of pottery from the Roman forum in Corinium, and some gilded highly decorative Anglo-Saxon brooches from the Butlers Field Anglo-Saxon Cemetery site. James also passed round some fabulous almost complete Bronze Age pottery beakers with complex geometric decoration, and some amazing Stone Age tools from the collection. It’s always a treat to be able to hold these objects from the past, to get a direct connection, as it were. I should emphasise that all of the volunteers, being very experienced now in handling archaeological objects, were very careful not to drop any of these precious pieces as they were passed around! We all enjoyed this look at the collections behind the scenes and send our thanks to James Harris for a really enjoyable talk. back to geometry class, but all of the volunteers managed to produce some very recognisable drawings of pots and with a bit more practise could definitely produce accurate drawings of publication standard. 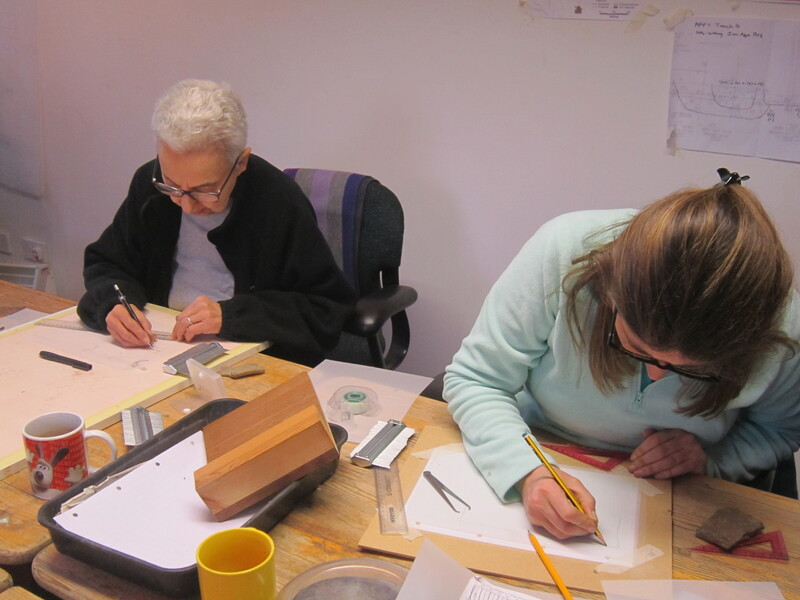 We plan to start the volunteers who enjoy drawing pot profiles on a programme of pencil drawing of the larger rim sections over the next few months. We will concentrate particularly on the hand-made Iron Age pottery in the assemblage, as the shapes and the decoration are often very individual and not mass-produced like much of the Roman pottery. This will be another useful archaeological skill for our volunteers to take away from the Trendles Project. …where is the time going? Our teams have now almost finished identifying the pottery and animal bone from the excavations and for the first few months of next year we will be busy preparing for our exhibition to be held at Abingdon Museum in the Spring. But for now it’s time to relax into the Christmas period and we were very pleased to welcome William Wintle to the lovely old boardroom at Manor Farm where we held our Christmas party. Before we all tucked in to the Christmas goodies and Simon’s special Roman mulled wine (for the non-drivers!) William spoke to us about the research he has undertaken over several years in the fields surrounding our Roman temple and amphitheatre on Trendles Field. Through his geophysics he showed us barrow cemeteries, field systems and settlements dating from the Bronze Age through to the Roman period. These sites have disappeared above ground and many of William’s findings came as a surprise, even to those of our volunteers who live in the surrounding villages. With so much archaeology in the area William didn’t have time to talk about the Roman villas, but he has promised to come back again next year to tell us more. Interesting talk, good food and great company – it was a lovely way to end the year. 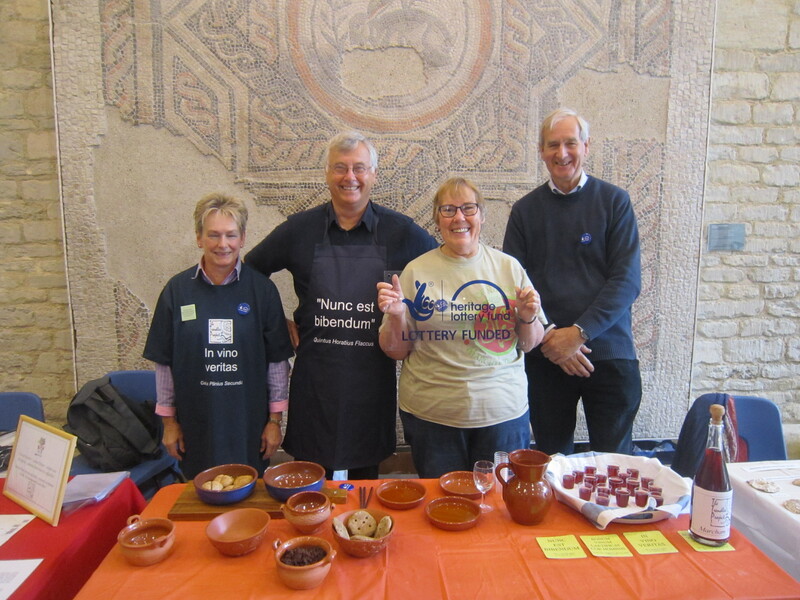 On the 16th October 2014, the Trendles team visited Waddesdon Manor in Buckinghamshire to see the travelling exhibition of the Lod mosaics, part of a very elaborate set of late Roman mosaics discovered in the Israeli city of Lod in Israel. One large panel was conserved and removed in sections so it could be shown in museums across America and Europe. The design on this panel is very unusual and shows a large array of wild animals, sea creatures, and a marine scene with boats of the period – all portrayed in great detail and done with great skill. Accompanying this mosaic was a small exhibition from the private Rothschild collection, of Roman antiquities from the same period, including gold jewellery, coins, pottery and other artefacts. The realistic details of the animals and the fish was quite amazing and we all spent a long time looking at the intricacies of the design and speculating on how they would have constructed this and how many artists and craftsmen might have been involved. 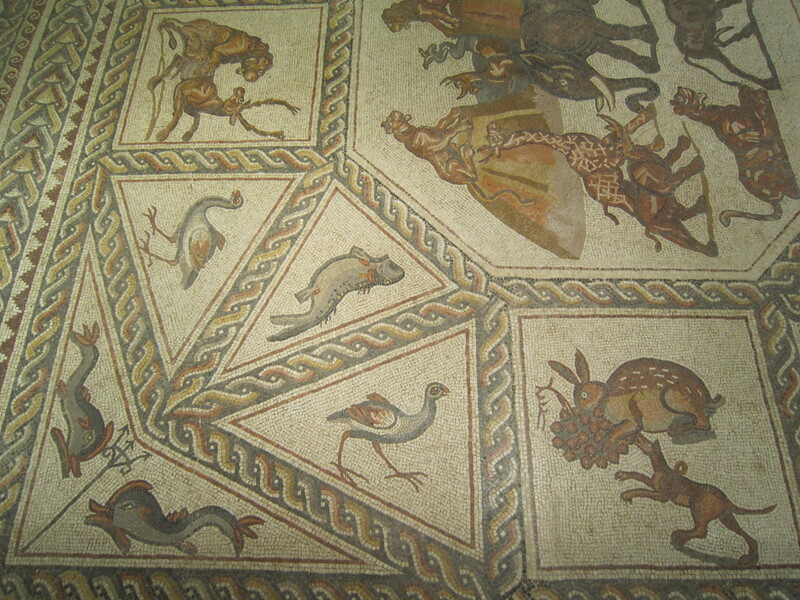 Everybody seemed to have a favourite creature or scene on the mosaic. Mine was probably the very detailed depiction of two cargo boats, showing all the rigging and technical features, plus for some mysterious reason two almost cartoon-style ducks sitting prominently on the back of each ship! None of us could work out why there were ducks on board or what they might symbolise – so if anybody could enlighten us on this point we would love to hear from you! We finished the day with lunch at the café, a wander around the beautiful gardens and for some a lingering look at the famous Rothschild wine cellars and impressive wine shop. As no Roman style wine was available, and sticking to our archaeological theme for the day, we only looked and did not imbibe! 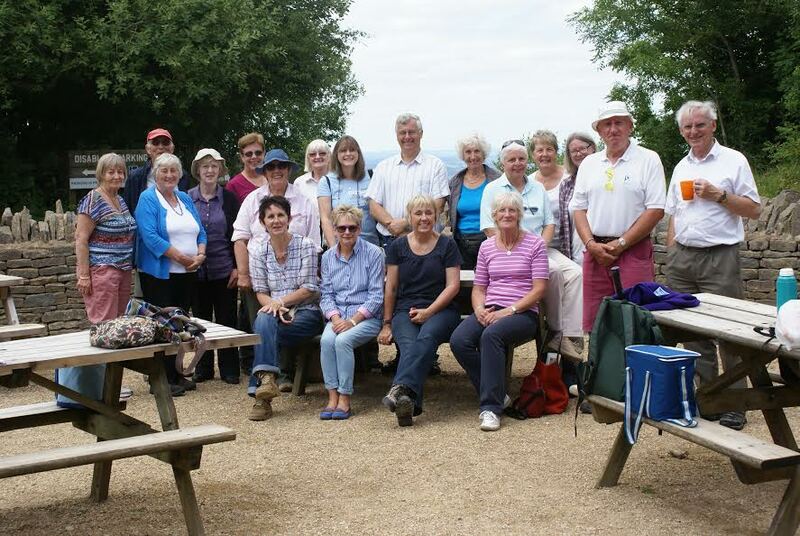 Spent a wonderful sunny July day exploring the multi period site at Crickley Hill and then on to Chedworth Roman villa – Many thanks to the staff at the Country Park for opening the Visitor Centre for us and to our very knowledgable guide Alan, at Chedworth Villa. A big thank you also to Cothill Educational Trust for once again loaning us their minibus and to our driver for the day, Simon. We’ll be posting a full report shortly.